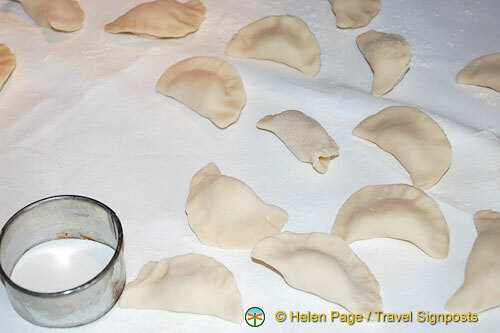 A taste of varenyky or pierogi is a must on any trip to the Ukraine. These dumplings come with a range of fillings, including potato, potato and cheddar cheese, potato and mushroom, cottage cheese, blueberries or cherries. Varenyky is a staple dish of the Slavic countries and many nationalities have variations of dumplings as part of their national cuisine, including the Italian ravioli, Polish pierogi, Russian pilmeni, Jewish kreplach or Chinese dumplings. Varenyky is also a traditional Ukrainian Christmas food served at their Christmas Eve Holy Supper. Varenyky dumplings are boiled and are very often served with onions and sour cream. 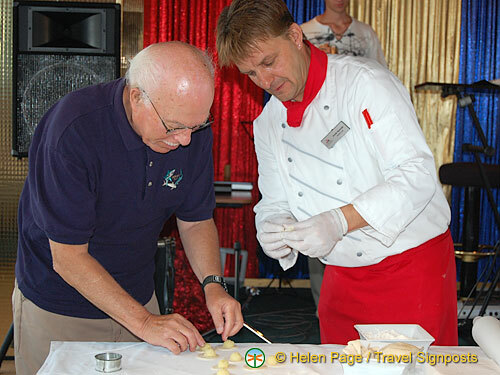 Varenyky cooking lessons is one of our Ukraine river cruise on-board activities and the chef makes it look really easy. First impression, the dish looks a bit bland, but on tasting it, I must admit that they are really tasty. Below is a recipe for potato and mushroom varenyky which is quite easy to make. – Roll the dough to 2mm thickness and cut with a round cutter. – With a fork, press on the border to seal. – Place the varenyky dumplings in a large pot of boiling water. When the dumplings float to the surface, scoop them and place onto a plate. – Gently fry the onions in butter and sprinkle these on the Varenyky. – Pour sour cream over the varenyky and garnish with herbs and serve immediately.